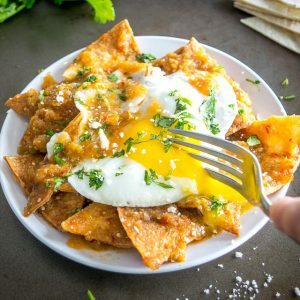 Chilaquiles have become more common on brunch menus across the States, but I’m usually disappointed with the restaurant versions. By the time the Chilaquiles get to the table they’ve spent way too much time in transit and you end up with a soggy mess. But when they are hot and semi-crispy they are a real delight. It’s worth trying out a batch at home to see if your palate agrees. And of course, serving them with a freshly made Salsa means they will outperform anything you can get at your local breakfast spot, so no skimping on the homemade Salsa as it’s one of the keys to this dish! So you want your Chilaquiles hot and crispy? And you don’t like frying food at home? 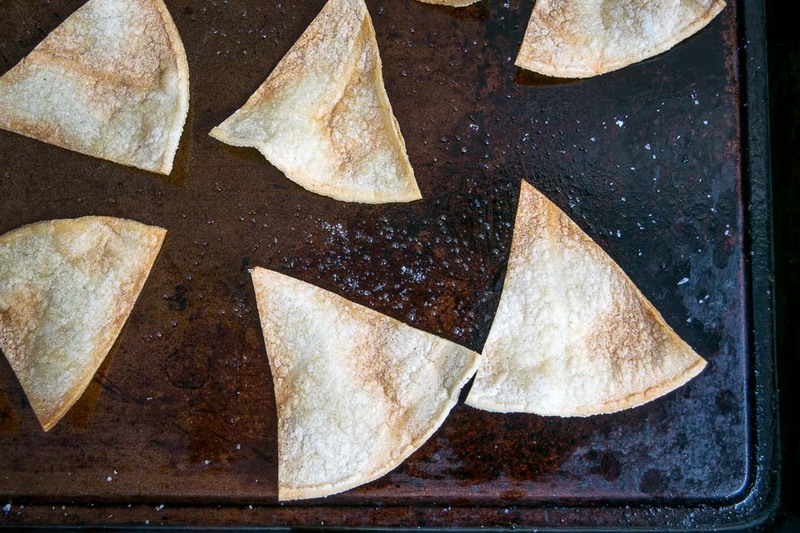 It’s true, a traditional batch starts with fried corn tortillas. You can do this by heating up a 1/4″ layer of oil to 360F and adding corn tortilla pieces. Cook them until they are turning brown and the bubbling subsides. But you can get pretty darn close to fried tortillas by baking them, and that’s what I default to lately. Simply add a thin layer of oil to a sheet pan. Rub the tortilla pieces in the oil and then give ’em a splash of oil on top as well — I usually use an olive oil sprayer for this, but a pastry brush or even your fingers will work just as well. Add these to a preheated 350F oven and cook until golden brown. This will take anywhere from 10-15 minutes, depending on your oven. This batch was in for 13 minutes. I think they taste best when the edges are crispy and the center is still slightly pliable. If you cook them longer in hopes of getting the center crispy then they become too brittle. And for both of these options, older tortillas tend to work best. Older tortillas typically have less moisture and will crisp up easier. 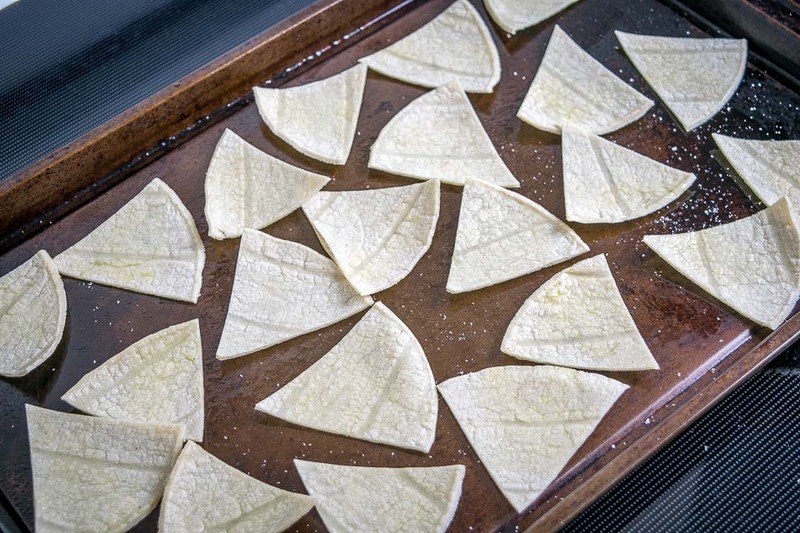 If you are using newer tortillas it’s worth letting them rest on the counter to dry out a bit, but this step isn’t crucial. 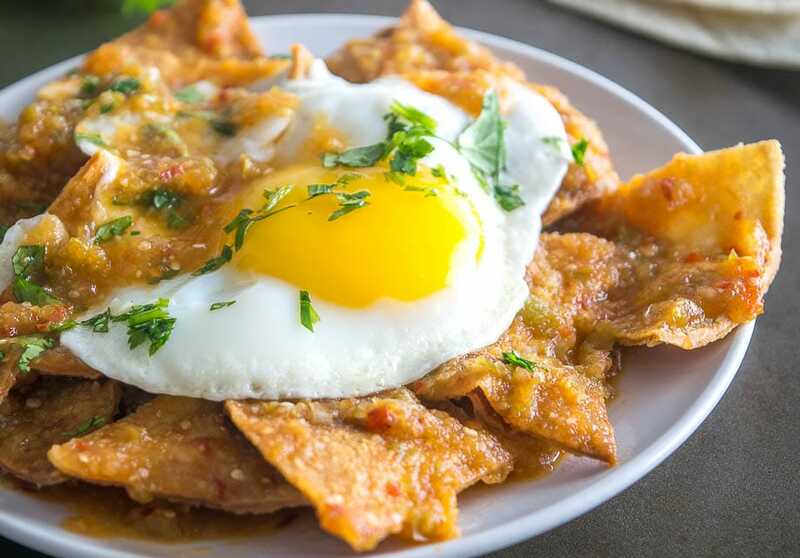 The essence of Chilaquiles is crispy tortillas coated with a lipsmacking Salsa. And when your Salsa is freshly made then the dish gets an instant upgrade, so no cheating with store-bought salsa! Chilaquiles Verdes is probably the most common version served up these days, and it uses a traditional green Salsa to coat the tortillas. This is a great option, so if it appeals to you then feel free to use this Salsa Verde recipe for your homemade Salsa. It’s one of my favorite Salsas on the site so if you’re new to it then consider giving it a go. It’s remarkably easy and you get incredible flavor from very little effort. Start by roasting 4-5 tomatillos in the oven. They’ll need about 15-20 minutes so I usually put them in the oven before adding the tortilla pieces. And don’t forget that you’ve got options on how to roast tomatillos as seen in this post on different ways to make Salsa Verde. Give it a whirl and take a taste. Awesome eh? So much flavor from so few ingredients! It will be fiery but it will get diluted a bit by the tortillas so keep that in mind if you are tasting it right out of the blender. Of course, if you prefer a milder version you can always start with a single chipotle and go from there. 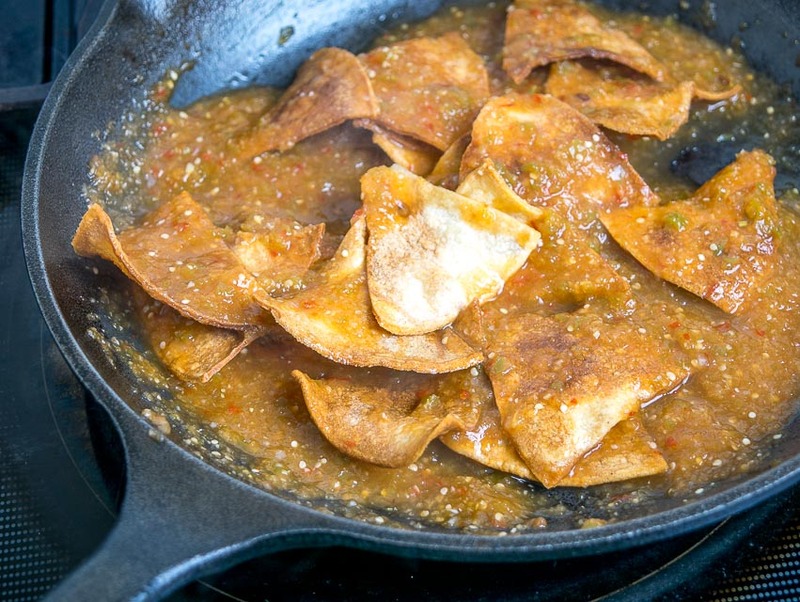 We’ll heat up this Salsa by adding it to a dollop of oil in a skillet over medium heat. If it seems thick you can always add 1/4 cup water or stock to thin it out. Let it cook for a few minutes until bubbly and take a final taste for seasoning. I will sometimes even skip the salt on this Salsa as it already tastes good enough to me, but you are welcome to salt to taste. And if you want to amp it up you can always add some adobo sauce from the can for additional heat. Once you’ve reached this stage be sure to have all your other fixings in order. Because we want our tortillas crispy! If you let them sit in the Salsa while you cook the other fixings then you’ll enter Soggy Territory. I’m serving this version with chorizo and some sunny side up eggs, and both are cooked and ready to serve by the time I put the tortillas in the Salsa. Plop the baked tortilla pieces in the Salsa and leave them in the pan long enough to coat them, but no longer! We’re not cooking them or letting the tortillas absorb too much of the sauce as that turns them soggy. Create a bottom layer of tortilla pieces and add your fixings. I added eggs, freshly chopped cilantro, and not pictured is a baked chorizo link on the side to keep me full. And of course, if there is leftover Salsa in the pan then spoon it on top of your Chilaquiles and all will be well in the world for a few moments. Okay, let me know if you have any questions about these Chilaquiles. It’s worth trying out this semi-crispy version to see how well it works with your palate. And once you find a combo that you like then you can get creative with the fixings. The crispy tortillas coated with homemade Salsa are the perfect starting point for a variety of meals you can make on the fly. 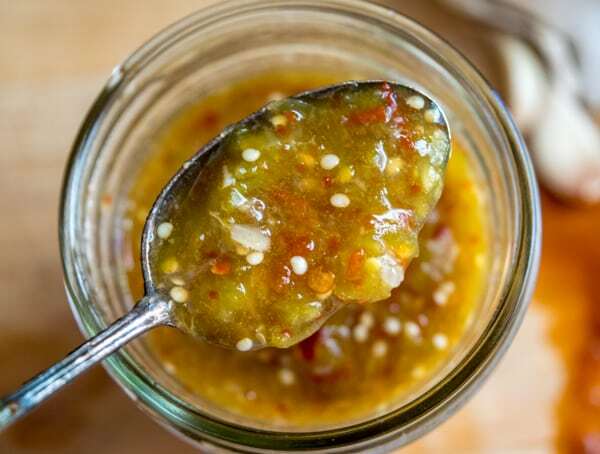 Tomatillo Chipotle Salsa is perfect for a batch of quick and crispy Chilaquiles. I served this version with eggs and chorizo but you can get creative with the toppings. Start by husking and rinsing the tomatillos. I usually de-stem them as well. 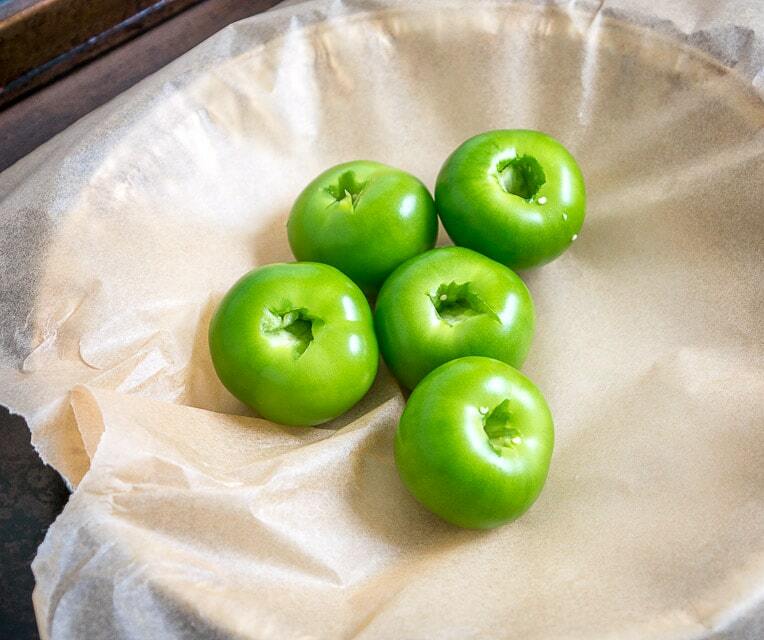 Roast the tomatillos in a 350F oven for 15-20 minutes or until they turn army green in color. 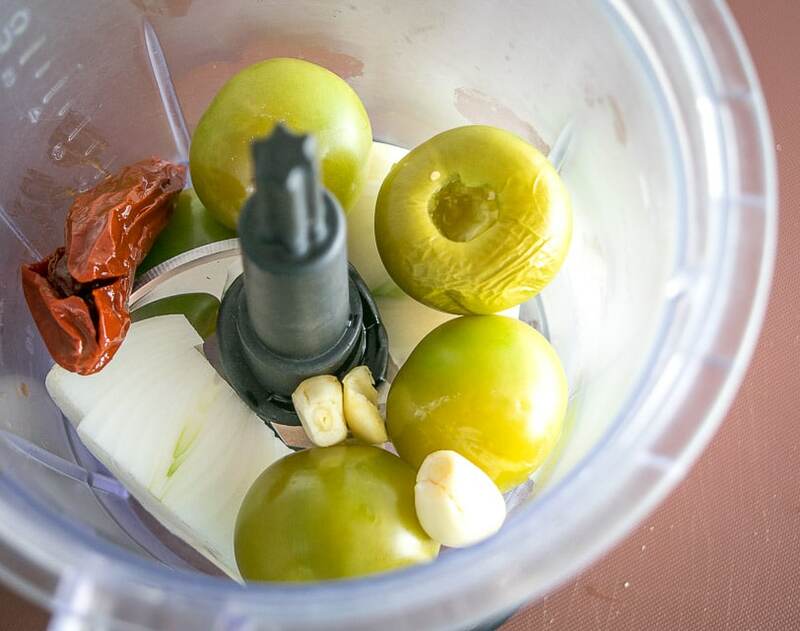 Once the tomatillos are roasted, put them in a blender along with 1/2 onion, 2 peeled garlic cloves, and 2 chipotles in adobo. Combine well. 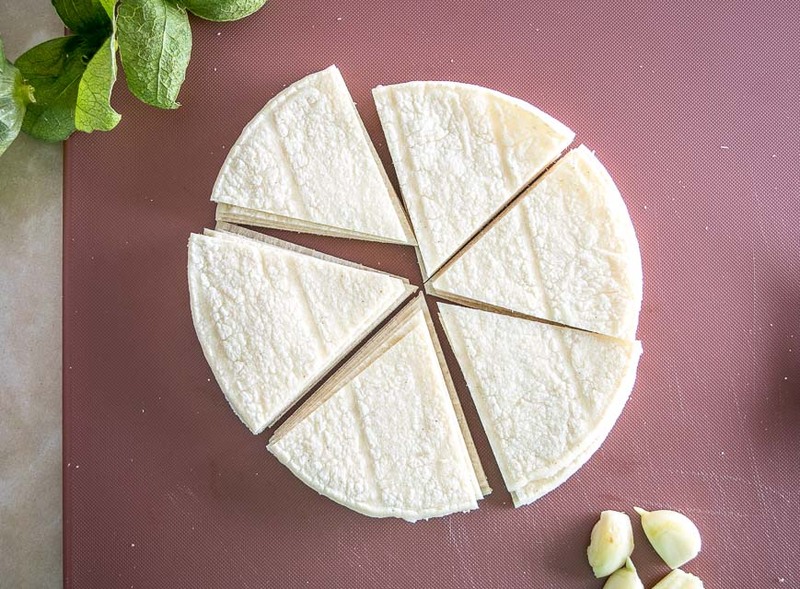 I usually cut the tortillas into sixths, but cutting them into quarters will work too. Add a thin layer of oil to a sheet pan and rub the tortillla pieces in the oil. 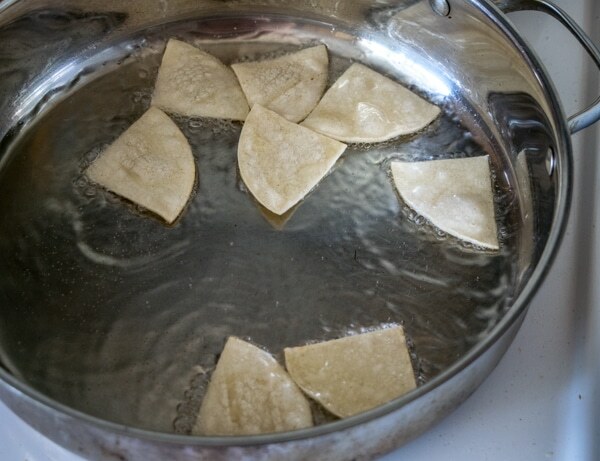 Add a layer of oil to the tops of the tortilla pieces too -- I usually use an olive sprayer for this but a pastry brush or your fingers will work too. Bake the tortillas in the 350F oven for 10-15 minutes or until they are turning golden brown. This batch took 13 minutes. 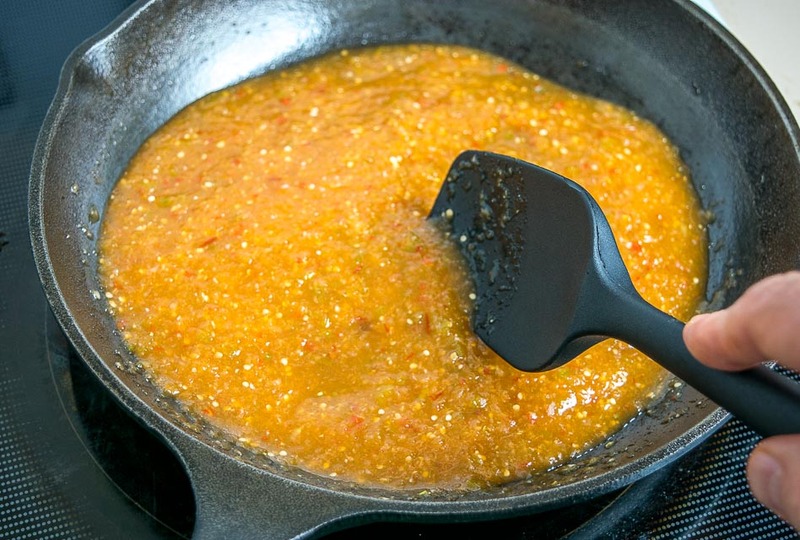 Add a dollop of oil to a skillet over medium heat and cook the Salsa for a few minutes until bubbly. At this stage, be sure to have your other fixings in order. We don't want to leave the tortilla pieces coated with Salsa for too long or they'll get soggy. For the eggs, heat up a thin layer of oil in a skillet over medium-low heat. I also typically add a knob of butter but this is optional. Gently crack the eggs into the pan. For sunny side up, cook until the whites are set, partially covering the pan if you want. For over easy, flip and cook the second side briefly. When making sunny side up eggs I find it easiest to cook two at a time. For the chorizo link (optional) I typically plop it in the oven for 20-25 minutes or until cooked through. Add the baked tortilla pieces to the Salsa and stir to coat them, but don't leave them in the pan for too long. To serve, add a layer of the Salsa coated tortillas to a plate and top with the eggs. I also garnished with freshly chopped cilantro and served the chorizo on the side. If you have leftover Salsa in the pan then spoon it over the top of the eggs. Buen Provecho! 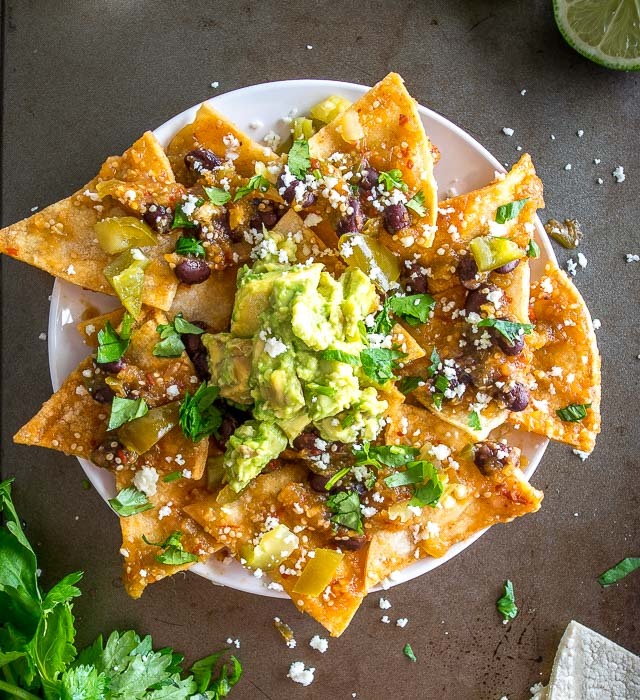 The keys to this dish are keeping the tortillas semi-crispy (by not soaking them in the Salsa for too long) and serving them up with a homemade Salsa. This recipe is designed for two people. If making for a larger group I would probably scramble the eggs for simplicity. If the Salsa seems thick out of the blender you can always add 1/4 cup water or stock to thin it out. I normally roast tomatillos at 400-425F to get there quicker, but I'm in the habit of baking tortilla chips at 350F so I kept the oven at that temp for this recipe. We also have a Chilaquiles version with Black Beans, Avocado and Pickled Jalapenos. Hello, Patric, your recipe looks delicious. My name is Omar Guzmàn I will try to make this for my family, I’m new in the blogging industry and I would like your opinion and tips on my recipes and techniques and if you would like I wouldn’t mind share tips with you. Okay thanks Omar I hope your fam enjoys the Chilaquiles! I just made this. FANTASTIC!! Thank you. I added a little quest fresco and roasted peppers and onions because that’s how I had it in a restaurant. Thanks Geralyn, I’m so glad they were a hit!